The weather has started to warm up. The tulips are blooming and Easter is almost here! This is my second favorite time of the year. Such a feeling of anticipation….baby chicks, fresh strawberries, bar-b-ques, trips to the beach, 4th of July fireworks……I can’t wait. No swimsuit is complete without flip flops! In the next day or two, you will find a wide variety of flip flops listed in our shop. These are handmade by Susan in our Northern California Studio. Our flip flips are called HEIDIS by It’s Sew Susan, in honor of my youngest daughter, who loves flip flops. We both love being barefoot. My daughter, her bridesmaids and flower girls were all barefoot for her wedding. If the truth be known, we would never wear a pair of shoes, if we thought I could get away with it. Since you can’t, flip flops are the next best thing! Other additions this summer will be beach towels, beach bags, more theme parties, chef hats and aprons, prairie dresses with sun bonnets and…….oh ……wait……. I’ll save this one for a while, but let me say, my son is sharpening his saw, and buying wood. Making little girls smile. This is why I sew. One thing we are always working on is new products. As you know, we started out with hand sewn doll clothes almost two years ago. It wasn’t long before we added shoes and some accessories. Last fall we added Birthday Party Packages to our shop. We are always on the look out for new items we thing our customers will enjoy. Well, today is the day we add a new line. Something we are very excited about. Our first refurbished doll! We have talked about this for about a year, but we had to spend time learning the best, most successful ways to make a once-loved doll shine again. 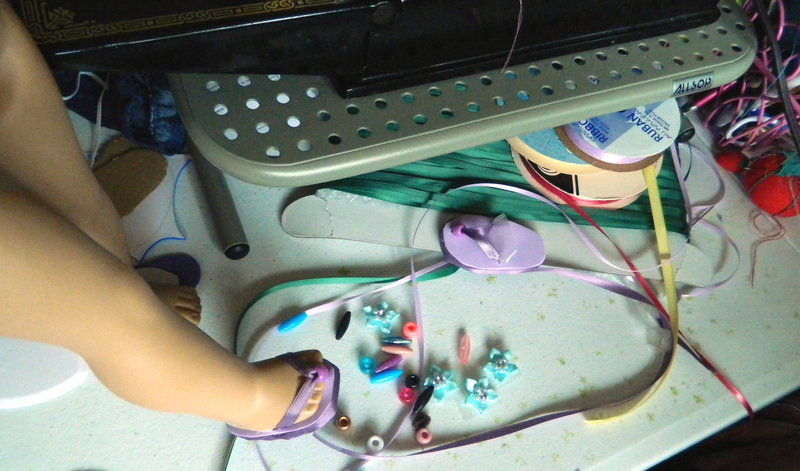 So we did our homework, bought some dolls and started experimenting until we were satisfied with the results. 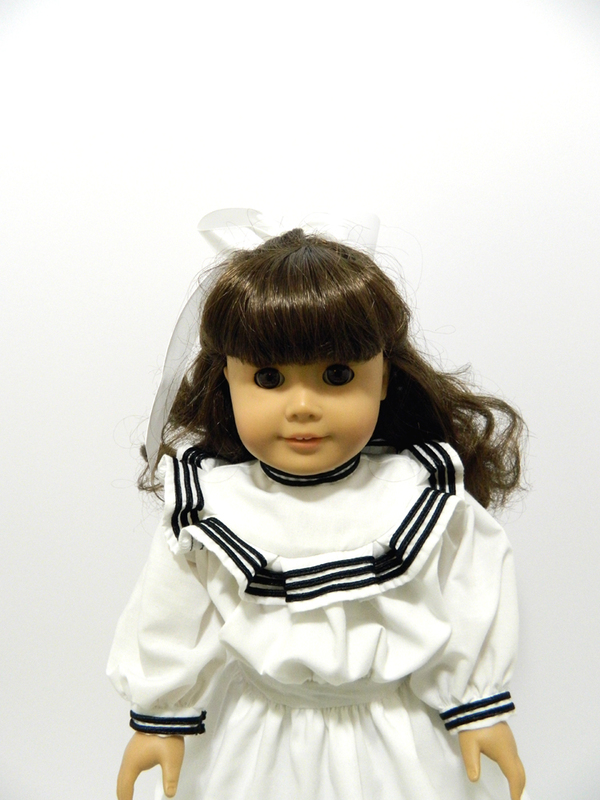 Today we listed our first refurbished doll, a Samantha. Most of you know, but for any readers not familiar, Samantha Parkington is a Historical American Girl Doll. Her story is set in 1904. She is a very kind and compassionate 10-year-old, who is being raised by her grandmother. She lives a life of finery and frills in her grandmother’s elaborate home, but when a poor family is hired as servants, to her next door neighbor, she befriends their oldest girl, Nellie. Samantha really is a delightful girl! We are so excited to offer these refurbished dolls. We will be adding more, as we are able to find them. Let us know what you think. Also, if you are looking for a particular doll, let us know. We’ll keep our eyes open for one for you. Our customers have the best ideas. Kathleen contacted us wanting a pair of McKenna pajamas for her little girl’s doll. Of course, McKenna being the 2012 Girl of the Year, they are all retired. This makes them very expensive in the secondhand market, even IF you can find them. Since I had never tried to replicate an American Girl outfit, I decided I would accept the challenge. Finding a fabric for the pants was a bit difficult. There aren’t a lot of stripes at the market, right now. Stripes in the right scale, color and with stars? No way, but I came away with something I thought I could work with. Robert and I put our heads together and finally decided to paint the stars on the fabric ourselves. 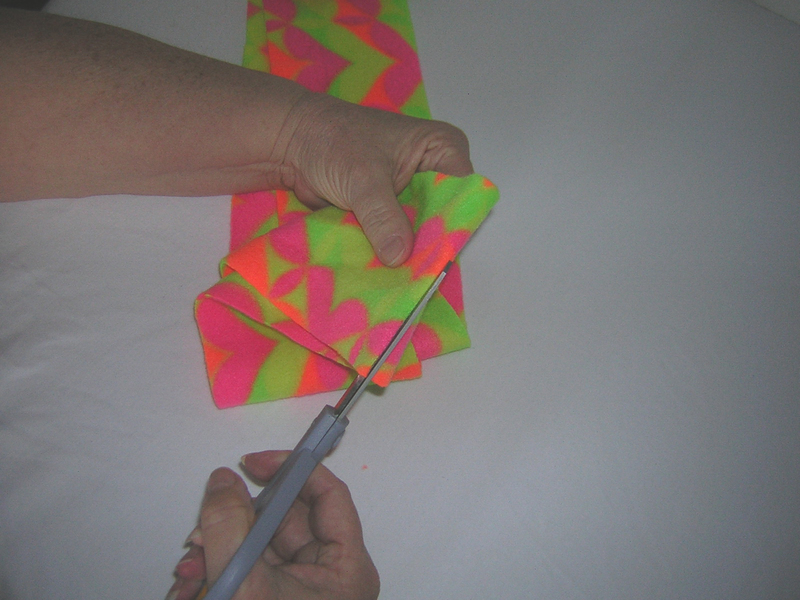 This took me back to my days of teaching tole painting and fabric painting in the late 70s. It was great fun. I used a Liberty Jane Pattern to sew the baseball-style pajama top. Robert made the graphic. He is very particular and won’t settle for something less than great. He has become a master at this and can truly make great customized graphics for your doll’s tees. Moving on to the slippers was the next challenge. Having only made three pair of doll shoes, in the past, I wasn’t sure where I would go with these. I couldn’t find a pattern for this style slipper, so I drafted my own. Next I found a “minky” fabric with a low pile, which was perfect. The final step was searching out the cute little stars for the slippers. So, we wrap up another pleasant day at It’s Sew Susan. We love our customers. We love their wonderful ideas and we love their challenges….Keep ’em coming! Don’t you love January? I do. It is the time for setting goals and planning. I don’t do resolutions. I never keep them. I need something more tangible, with steps to carry out my goals. From these beginning steps, I find great motivation. I love all the ideas swirling madly in my mind, putting them on paper and making sensible plans to meet them. Last week, Robert, Skylar and I sat down for our annual planning meeting. We pulled out the notes from last year’s meeting to see what we had achieved, what we wanted to move over to this year’s goal list and what new goals we wanted to accomplish. It was very exciting! In 2012, we introduced the American Girl/18” Doll Birthday Party. We offered the Tee Shirt Decorating Party, Tutu Making Party, Fairy Wing Decorating Party and the Headband Decorating Party. We added Party Hats to our shop and, after a request from a customer for Little Girl Fairy Wings and Tutus, we decided to added these to our shop, as well. These have all been a great success! This year’s doll donation was bigger than 2011’s. We gave more dolls and many more outfits with each doll. We also included a tote for each doll. My earlier posting tells all about this highlight of our year. 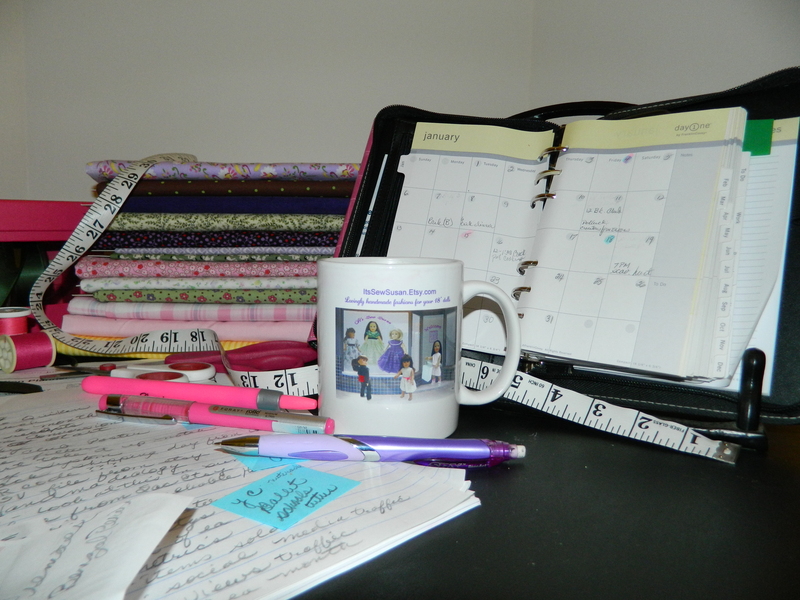 After moving several items from our 2012 goal list to 2013’s we were ready to get all the whirling ideas from our heads to paper. I am sleeping better now because it is on paper. We don’t want to divulge too much here, but let me say this: If you have a little girl’s birthday party in your future, you will want to start following us! We have some great things planned. If the little dolls in your family ever get hungry, well let’s just say, you will want to keep an eye out for this new line. We will also introduce clothes for Bitty Baby! We love her and we feel she needs her own It’s Sew Susan wardrobe. And, last, but not least, ummm, hmmm, do I tell you? Let’s just say, if you enjoyed this posting: https://itssewsusan.wordpress.com/2011/11/ you will definitely want to stick around! The brainstorming is so exhilarating. Planning it is motivating. At age 13, Skylar had a lot of wonderful ideas, which we are implementing, too. It has been fun giving you a sneak peek at just a few of our 2013 goals. I am so inspired! My mojo level is very high. Off I go to turn these goals-on-paper into a reality! Merry Christmas to 12 Little Girls from YOU! Thanks to our wonderful customers, we were thrilled to have been able to donate over $1000 in dolls and doll clothes this year! As you may know, we take the first 10% of our gross sales and buy dolls to donate. Throughout the year, I sewed clothes to send along with the dolls. The dolls had 5 outfits, a leotard/swimsuit and Skylar made a tutu for each, as well. Robert is very involved with this project, too. He shopped all year to find the right 18” dolls. In addition, he researched and selected the charity for our donation. This year Toys for Tots was our recipient. Last week, we all worked to package the dolls and outfits into carrying totes for the girls. On Thursday morning, Robert and Skylar delivered the gifts to the Toys for Tots Distribution Center. It gave us great joy to wake up this morning, knowing 12 little girls were opening up dolls and doll clothes donated by you and us. Little girls that may not have received anything without this donation. None of this would be possible without the support of our customers! It is a highlight of the year for us. This is our second year in business and the second year we have been fortunate enough to gift dolls to deserving little girls. Last year, through the Rocklin Moms Group, we donated dolls with outfits to Love, Olivia. We look forward, with your help, to donating even more dolls next year! We are so excited to add more PJs and sleeping bags to our shop! We now have ELEVEN different sets, many with matching sleeping bags. Do you remember receiving PJs on Christmas Eve? I sure do!!! My kids ALWAYS got new pajamas on Christmas Eve! Wanted those Christmas morning pictures to sparkle, you know. Some years I bought them, some years I made them. My youngest son, now 22, still hangs his head at the mention of Christmas PJs. You see, in 2009, I made everyone flannel penguin print PJ bottoms and red tops. However, in the moment of “let’s take this over the top” I appliqued 10″ penguins to the shirts! What a good sport he was! He even let me capture a few pictures! Do notice the position of his arms! Ha Ha! You must grab some PJs for your doll’s Christmas morning! If your dolls have been longing for a slumber party or movie night, these are too perfect! If ordered today, the USPS says you will received them for Christmas with Priority Shipping! Here in northern California, we are still going back and forth between hot days, in the 80s, and cold days, in the 50s. It’s hard to know how to dress for a day outdoors. The evenings are definitely cool, so, even if you start out in something light, you need some warmth in the evening. 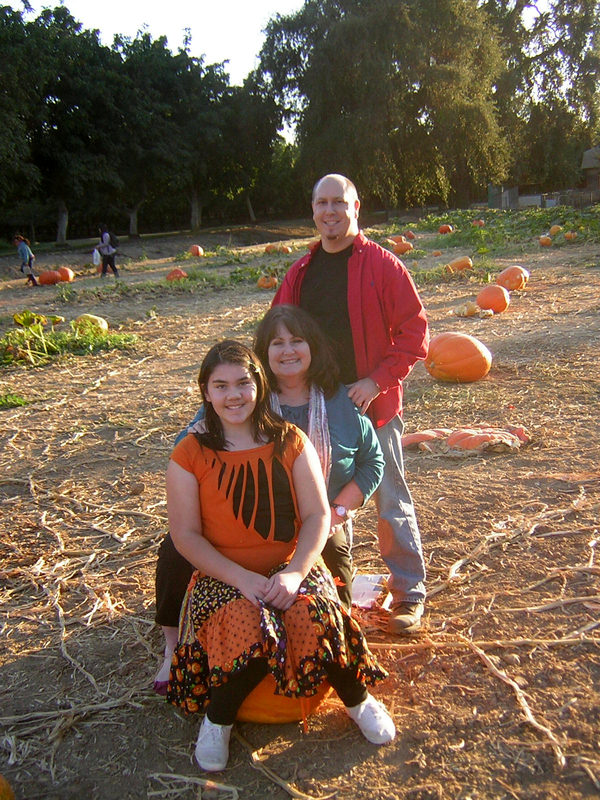 A couple of weeks ago, we headed out to Bishop’s Pumpkin Farm, in Wheatland, CA. It was a great day, which started out warm but, when the sun went down and we found ourselves eating fresh-baked apple dumplings with ice cream, we definitely needed something warmer around our necks! I had a light scarf around my neck, but was wishing for something warmer! All this made me think of a warm, cute and easy fashion accessory for your 18” doll. You know, they get cold in the Autumn, too. 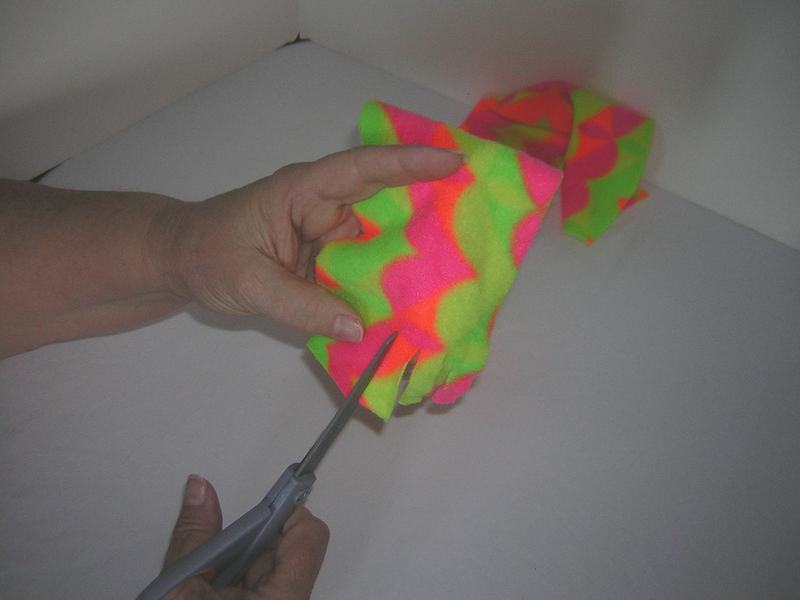 So I’ve put together this little no-sew tutorial for you. This would be so much fun to do with your granddaughters the next time they visit. As you know, we are very busy developing 18” doll birthday party ideas. Thinking this would be a very easy craft for the younger girls to do at a doll-themed party. So….let’s get going….. First thing you’ll need is some fleece. I purchased a 4” strip of 60” fleece. At first, I was looking for small scaled prints, but in the end, I decided I like the large prints better. 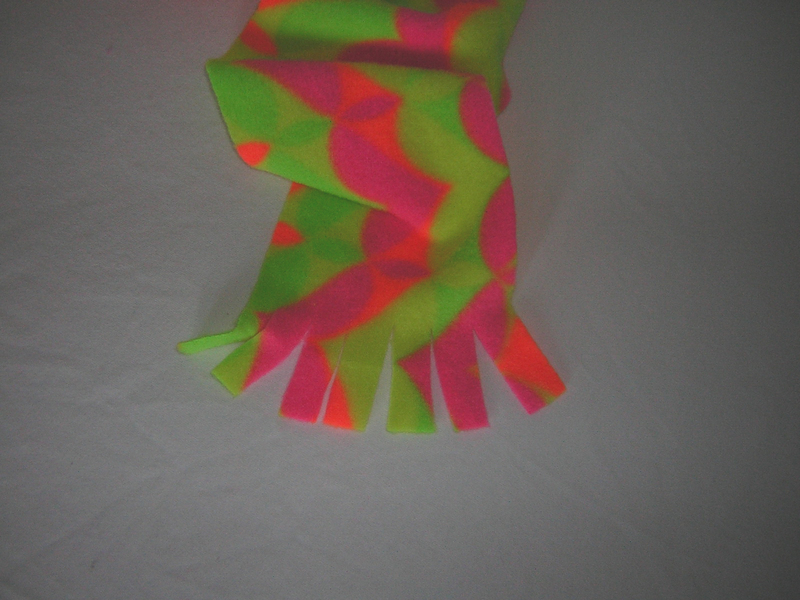 You can’t really see the pattern, but I like the indistinguishable all-over pattern best for a scarf. At this point, you have a choice of widths. All the scarves shown here are 4” wide, however, Robert feels the dolls look like they are being choked by the finished scarf. To me, it looks warm and cozy. So, you decide…either 3” or 4” wide will work just fine. At my local fabric store, they are very careful to straighten the edge before cutting your piece, so the most difficult part is already done for you..
Cut the selvage off both ends. Cut 60” length in half, making two 30” pieces. If your length happens to be a little longer or shorter, no problem. This will give you two scarves. Set one aside or make it along with your granddaughter, for YOUR doll. You do have a doll of your own, don’t you? The little girl inside each of us still loves dolls. Your granddaughter will have more fun playing dolls with you, when you have your OWN doll! And, you will have so much fun dressing her up! Clip into the short end every ½” apart and 2” deep. No need to measure. Just eyeball it. Wrap around your dolls and admire. Don’t they look warm and snugly? 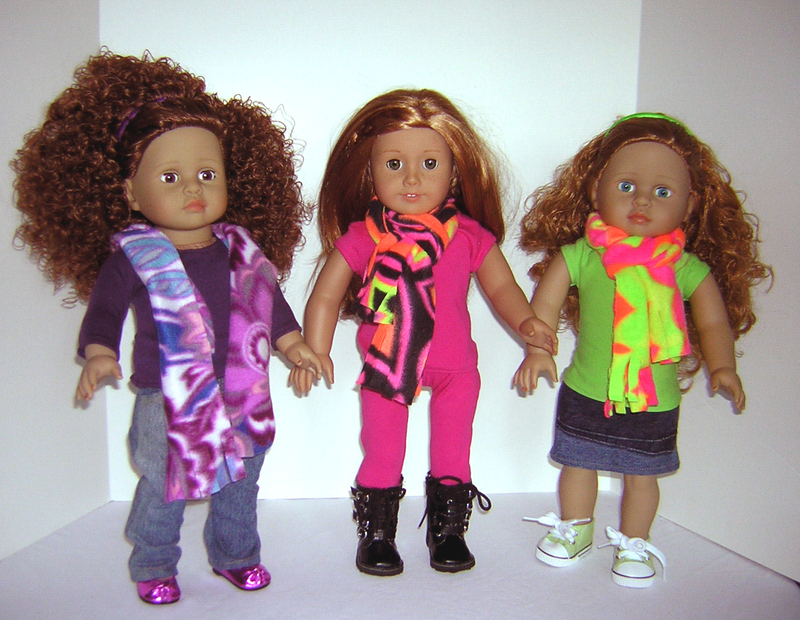 We’d love to see pictures of your dolls with their new scarves! Send them to ItsSewSusan@comcast.net and we will post them here. So there you have it, our first craft for your 18” dolls. We hope you enjoyed it, but most of all, were inspired to make these up. What about helping you daughter/granddaughter to make these for all her girlfriends for Christmas? Maybe even matching sets…one for the little girl and one for the doll? For a little girl version, I would start with a 12” width and use the entire 60” length. 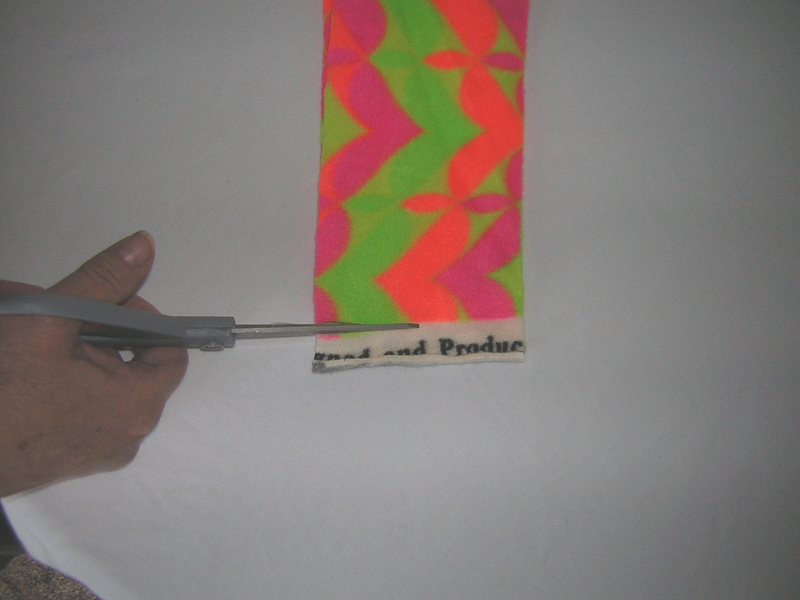 I would still cut the ends at ½” intervals, but make those cuts 4” deep. Enjoy! 200 Strong and Counting! Let’s Have a Party! Yes, that’s the count. As of today, I have made 200 tees for your 18″ dolls! That is very exciting to me. And, for those who like milestones, that is 600 hand-sewn snaps! Just the time spent sewing those snaps adds up to 30 hours! Some kind of statistics, huh? Most of these tees have gone out for parties. We are now doing a large business in birthday parties! This is so much fun! We love being a part of a little girl’s birthday dreams! Our parties are totally custom….mix and match….have it your way. Whether the party is for 5 or 20, we are here to help you! Some of the tee party ideas this year? For the party in the slide show, the girls decorated tees and fairy wings. At another party, the girls decorated tees and denim skirts with fabric paint. Girls and dolls in matching outfits. . .no decorating required. Aren’t they the cutest? Matching shirts, matching jeans and matching flip-flops. Darn, these are cute. There are lots of options.In addition to tees and wings, we have tutus, leotards, jean skirts, leggings, jeans. . .any combo of these would be a great party.And for the weak at heart, we even offer a simple headband party. Whether you want headbands for the dolls or matching headbands for the dolls and little girls. These are sure to be a hit when the girls get to decorate them! These are also great ideas for Girls Scouts, clubs, Christmas Parties and New Year’s Eve get-togethers. Keep your eye on ItsSewSusan.Etsy.com. This week we will be adding party hats for your dolls. In the weeks to come, we will be adding more themed parties. I can’t get to them fast enough. If you have a party idea for us, enter it in the comments below. Instead of visions of sugar plums dancing through my head, I have visions of doll parties twirling over my bed.